Neighbour to Zumthor Written on February 3, 2010, by Ingeborg. 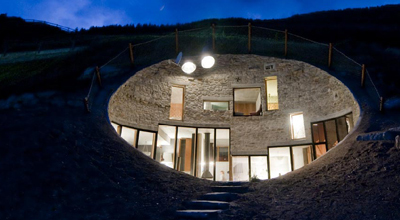 What if you want to build a holiday home in sight of the architecural highlight Therme Vals? SeARCH and CMA found underground was the respectful place. Still the space and style of their Villa Vals displays a high architectural value for itself. The process was flexibel, making room to welcome unintended presents like a hidden well, lost brick, Swiss craftmenship and child’s play.